We serve many states in the USA, with countless citizens in Bethpage, New York benefiting from our trusted services. Commercial & Residential Services – Our team can perform full restorations on commercial and residential properties in Bethpage, NY. We prevent lasting damage to your carpets, ceilings, drywall and the whole house after leaks. Salvaging First – We promise to save every original aspect of your Bethpage property that we can. We only replace things as a last resort or at your request. 24/7 Availability – Come rain or shine, storm or snow, we’re ready and waiting to attend your call. Our efficient home repairs are carried out all year round due to the extreme weather conditions in Bethpage New York. Whether it’s laying tarps before a storm or clearing up leaks after a weather event, our water mitigation services are available around the clock. Call in our Bethpage plumbing experts to stop the leak and clean up the mess. All Dry USA will be the first response on the scene for any leak emergency in your Bethpage, New York home. We know it is vital to act quickly to save your property, furniture and possessions in the event of a flood. Contact us today on our 24/7 Bethpage phoneline for leak mitigation and flood prevention services now! Advanced Techniques and Equipment – All Dry USA has the latest technology and state-of-the-art equipment. Our company uses the best of the best to help restore Bethpage homes and commercial properties quickly to minimize cost. All Dry USA in Bethpage New York can help make the restoration process simple for you when dealing with the initial water damage mitigation. For more information on water damage clean-up services and restoration company for residential or commercial property, contact All Dry USA today to speak with one of our experienced technicians. The water restoration repair process starts as soon as you make the first call to All Dry USA. Our Bethpage water damage technicians are available to you 24 hours a day for emergencies large or small. We know the importance of acting quickly. We understand the amount of stress, confusion, and how chaotic things can seem. We have the trained experience and state-of-the-art tools to minimize not only property damage but also to reduce the traumatic experience for you. Our first step is inspecting Bethpage residential or commercial properties to examine the extent of the water damage. During the evaluation, our team will put together a plan that best suits your needs. Once our team locates the leak source, we stop the leak, check for freshwater contamination and classify the water source. Once the assessment is complete, we will remove the contents, furniture and property within your Bethpage home or commercial business to help avoid stains, rust and further damage to furnishings and flooring. During our inspection, we will inspect hardwood floors, carpet and carpet pad to determine if removal will help save the subfloor from damage. 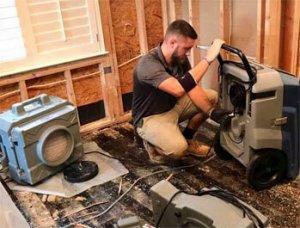 Our Bethpage water damage restoration experts use dehumidifiers to help avoid more water damage such as warping and swelling floors, walls and furniture. We use air movers with high-speed airflow on carpets, pads, walls, and furniture to help speed up the drying process. All Dry USA offers services in helping restore water, mold, fire or smoke damaged belongings. Our Bethpage team can help save your valuable belongings, saving you money and heartache. Our team at All Dry USA Bethpage is specially trained to help remove odors caused from water damage by using industrial grade tools to remove odors thoroughly. Our sanitation process involves antibacterial, disinfectant and antimicrobial treatments to help with the clean-up process. Once the water damage removal is complete, our team will dispose of material that became damaged. Carpet water removal – our Bethpage All Dry technicians drain, dry and clean your carpets to stop mold in its tracks. We act fast to reduce damage to your floor foundations underneath. Ceiling repair – floor damage and the destruction of ceilings beneath makes your home a danger zone – the ceiling could collapse. Leave it to the experts and call All Dry USA in Bethpage who will repair a water damaged ceiling as quickly as possible, making your home habitable again. Drywall water damage repair – our Bethpage team locates the leak, removes or repairs soaked drywall, and leaves you with a structurally sound new wall. Don’t hesitate to contact us if your walls are affected by leakage or moisture. Basement water extraction – a flooded basement or house can compromise your home’s very foundations. If your Bethpage home is affected by basement flooding or foundation water damage, we’ll act fast to drain and dry the area to prevent further structural problems. A water in basement clean up is required as soon as possible after discovery. Roof water damage – after a storm, flood, blizzard or big leak, your roof should be inspected to ensure your home is safe. Our skilled specialists assess and repair water damage to your roof in a flash. Here in Bethpage NY, we’re used to repairing roof problems after winter storms. Your roof is in capable hands with us! Burst pipes – a burst pipe can spell disaster for your home, whether it’s a clean water leak or black water damage. This is incredibly common in the freezing Bethpage winter months – so our experts know how to handle it. The All Dry team quickly identifies the source of the leak and repairs damaged plumbing, so you can return to normal. Sub floor water damage repair – your floor’s foundations are most likely made of wood or concrete. After a flood, your wooden sub floor may need new dry parts, or concrete will need leveling out. Always call All Dry USA Bethpage to ensure your sub floor is restored after a flood – your home’s foundations depend on it. Water leak restoration – we clean up all problems resulting from a leak in your Bethpage property. Our team works magic to restore your home’s sparkle, leaving no trace of the leak! Mold inspection and removal – mold growth is a problem that affects not only your home, but your health. All Dry USA quickly clears any effect of mold in your Bethpage property and pinpoints the cause, whether it’s poor ventilation or a hidden leak. Mold can erode the structure of a property and even cause breathing problems. It needs professional sanitation and disinfection to be safe for inhabitants. Fix your Bethpage home’s mold problem today by calling in our friendly and helpful team. …But that’s not all! We will inspect and assess your home’s interior or exterior if you suspect a leak or have suffered any kind of water damage. We also offer full flood prevention services due to the Bethpage area’s proneness to flooding, blizzards or tropical storms. Our guarantee to restore your home to normality takes the worry out of water damage – leave it to All Dry USA Bethpage and keep your property dry all year round.